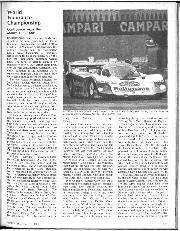 Maybe Jochen Mass made the most prophetic remark after winning at Vallelunga, when he commented that the cars would get better, and the drivers would get used to driving for economy. The opening round had almost been an embarrassment as the leading cars slowed, and then slowed some more to reach the finish line on their allocation of 510 litres, 15% less than last year's 600 litres. 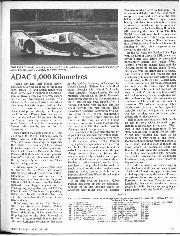 Almost unnoticed at the time was the fact that Mass and Ickx covered the distance in shorter time than the average of the last race held there, in 1983. Monza's result was distorted as the race was halted after four hours, but the winning average was almost identical to last year's. 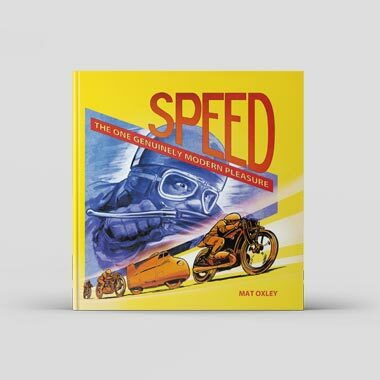 Then came Silverstone, run at a cracking speed, and the race time for 1,000 kilometres was nine minutes quicker than the same pairing achieved 12 months before. 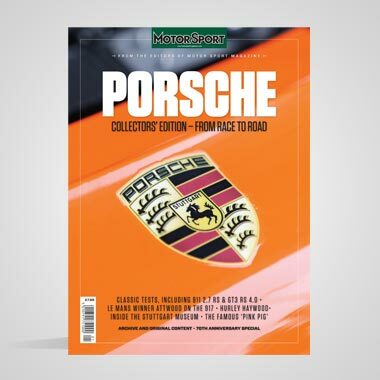 Nine minutes is a lot, more than six laps, and we were left to ponder that if the cars have 85 litres less to use, if the Porsche engines are detuned by 25 bhp, and if they are otherwise much the same as last year, where does the extra speed come from? Better tyres, suspension improvements and higher cornering speeds is the only logical answer, Jonathan Palmer in particular demonstrating an exciting turn of speed each time he tackled the Woodcote chicane. 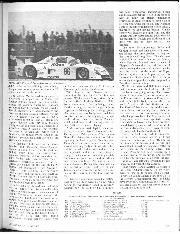 Palmer and Lammers did not win because their Richard Lloyd/Canon Racing Porsche 956B lost a front wheel after 102 laps, when leading. The Lancias then assumed a dominant 1-2 lead, but they didn't win either, Patrese's car having a front suspension breakage, Wollek's a frozen (or cooked!) gearbox. 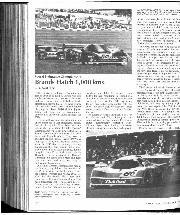 At the time the Rothmans-Porsches, running at a slower predetermined speed, were trailing badly and did not look like winners. The fuel consumption of the mid-race leaders was marginal, but still on the critical 51 litres per 100 kilometres, and had they not had problems it's not likely they would have slowed very much in the last hour. So the distance might have been completed in less time still, which really lays to rest the bogey of the 1985 fuel consumption saga. The privately entered Porsches continued to lose wheels, too, the incidence now reaching dangerous proportions. Palmer and Lammers were robbed of their lead, but Thierry Boutsen had two wheels fall off, both occurrences giving him heart-stopping moments. 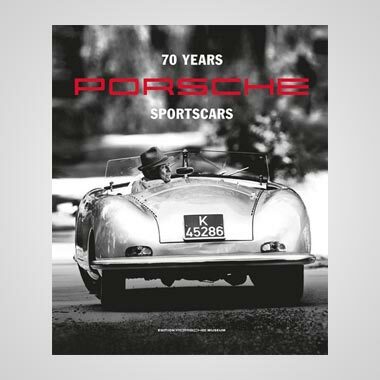 Jo Gartner, too, in John Fitzpatrick's Porsche had a wheel bound away into the scenery, and it can hardly be the sort of advertisement that the Porsche factory would relish. 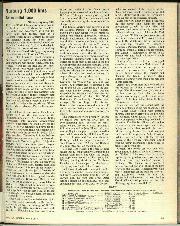 Significantly the factory cars have never lost a wheel, not once in three seasons, and car manager Norbert Singer insists that the Rothmans cars have the same suspension units as the customers, and they are not thrown away after every race (though they are rigorously crack-tested, of course). The factory's Speedline wheels are not quite the same pattern as the BBS wheels used by most customer teams, and for a long time the blame has been laid at BBS's doorstep. Now the pattern of the centre has been changed, but the wheels continue to fall off. Singer is quite adamant that the private teams are not tightening up the centre-lock nuts adequately, saying that "they don't believe our recommendation". Perhaps some proof of that was provided when the works training car was handed over to Lloyd's team to run as the camera car in the race. When Schuppan made his second refuelling stop the car lost seven laps because the mechanics couldn't get the wheels off, their air-powered torque wrenches having insufficient settings. Something needs to be done, and quickly, to put an end to this epidemic before there is a fatal accident. The sight of a Porsche coming to the pits on three wheels is now routine, and though it might be a testimony to the inherent strength of the car it's not the best way of proving it. The Lancia-Martini team, headed by Cesare Florio, continues to dominate the practice sessions. They arrive with special qualifying engines, full 3-litre versions of the Ferrari V8, running the twin KKK turbochargers at 2.6 bar boost (about twice what the Porsches use). Their power output is something in excess of 800 horsepower, fuel consumption being of no importance at all in qualifying, naturally, and decent Formula 1 times are the order of the day. Riccardo Patrese claimed his third pole position of the year with a time of 1 min 10.84 sec, the speed 149.0 mph. There was some interest in whether the Italian would lower the time to 1 min 10.3 sec for the first 150 mph sportscar lap of Silverstone's Grand Prix circuit, but this wasn't quite on for this year, anyway. Apart from anything else a strong northerly wind was keeping the Northampton circuit like an ice-box all weekend, and the qualifying tyres weren't getting up to decent temperatures. Patrese always has the qualifying tyres, and always starts the race, Alessandro Nannini being very much a number two. Bob Wollek and Mauro Baldi take their turns, as most teams do, and at Silverstone it was Baldi's turn to have the qualifying tyres, 1 min 12.75 sec being his best. It was enough, though, to keep the Porsches out, Hans Stuck's best being 1 min 13.12 sec which beats Stefan Bellof's qualifying time in 1983 by a mere four-hundredths. Also in the 1 min 13 sec bracket were Manfred Winkelhock/Marc Surer in the Kremer brothers' 962C, Palmer and Lammers, Boutsen and Brun and Ickx and Mass, so some close racing was in store. World Endurance Champion Stefan Bellof took the weekend off to test his new Tyrrell-Renault at Le Castellet so team owner Walter Brun stepped in to share with Boutsen. Steve O'Rourke's Emka Aston Martin made its first appearance since Le Mans 1983, shared with Tiff Needell and Bob Evans. The car looked very smart in Dow Corning livery and was the quickest of the British challengers, its 1 mm 20.75 sec also being the fastest normally-aspirated car time. Close behind, though, were the 3.9-litre, DFL powered Spice-Tiga of Tim Lee-Davey Neil Crang (1 min 21.15 sec), the 3.3-litre version of Gordon Spice and Ray Bellm in the C2 class (1 min 21.34 sec) and the new Carma Alba FF of Martino Finotto/Carlo Facetti/Guido Dacco, (1 min 21.89 sec). The new Ecosse was next, in the hands of Ray Mallock and Mike Wilds, though slower after an engine change; they didn't bother with qualifying tyres, either, though these are used more and more in C2 as the leadership battle hots up. The factory Mazdaspeed team came to Silverstone to prepare for Le Mans, two familiar looking, though quite new 737Cs entered for Yoshimi Katayama/Takashi Yorino and David Kennedy/Yojiro Terada. The oil radiators have been moved to the front and the monocoques stiffened, yet the cars are lighter than last year's 727Cs, scrutineered at 750 kg. The 2.3-litre rotary engines develop only 315 bhp, though, hardly enough to present a real challenge in a five-hour race. A touch of the Orientals was seen in Terada's car, which had a miniature, gilt Samuri sword taped to the bulkhead, perhaps for a hari-kari job if the driver made an error. The first half of the race was all about Lancias and Palmer's Canon-Porsche, running at 1 min 19 sec from the start and pulling away from the lowly-placed Rothmans-Porsches at two seconds a lap. First Wollek led, then Patrese, then a spectacular overtaking manoeuvre at the chicane put Palmer into the lead. By lap 22 Palmer had established a new Group C record at 1 min 16.98 sec (later he was to lower it again) and this didn't look anything like the economy run we'd been expecting. The leaders were going like the wind, but how much fuel were they using? The first pit stops showed that the leaders were on target, the Rothmans-Porsches having something to spare for a late charge if need be. Tactics vary this year, and provide extra interest. The Canon team went as far as possible on each tank, effectively making four and a half stops (to take on 410 litres), while the works Lancia and Porsche teams divide the race into six parts and make five stops of equal length, the target being to take on 82 litres each time. Rapid calculations indicated that the leaders were in fact on their average of 51 litres per 100 kms, and could go the distance. With Boutsen and Gartner out of contention the race for fourth place was between Winkelhock/Surer, Mass/Ickx, Larrauri/Sigala, Ludwig/Barilla and Bell/Stuck, the number 2 Porsche being tail-end Charlie in the group and in danger of being lapped at the 100-lap point. Ludwig's Joest New Man entry was badly hampered by a dreadful misfire in the engine, yet it was hardly slower than the works Porsches which is indicative of the waiting game that Peter Falk's drivers were playing. At the two-hour mark, lap 86, Palmer was harried by Patrese, Wollek was a safe third. Patrese passed Palmer on lap 89 but the two Grand Prix drivers had a real set-to, Palmer regaining the lead on lap 92. Ten laps later Palmer's chances were dashed when the car started vibrating badly at Stowe, then shed its left front wheel, disc brake and all, as the car appeared under the Daily Express bridge. The Canon car reached its pit safely but seven laps went down the drain while a new corner was fitted. As evidence of its competitiveness, Palmer later established a new record at 1 min 15.96 sec, he and Lammers actually recovering two of the lost laps on their way to a fifth-place classification. A Lancia double now looked a distinct possibility, as Stuck went a lap down while having the windscreen taped in securely. Nannini now led Baldi by half a minute, with Ickx 70 sec down, Winkelhock, Stuck and Sigala a lap behind. Then in the space of half an hour the Italian dominance crumbled, as Baldi stopped to have a piece of loose bodywork pulled off, and Nannini came to the pits with his front wheels askew, the track rod end having broken. A new corner was fitted on the right front, and the Lancia was three laps behind, good work by the mechanics. Wollek and Baldi could still have won, had not their gearbox then jammed. The Aston Martin-powered Emka and Cheetah entries had long gone with assorted failures, the same problem putting out the Lee-Davey/Crang Tiga. The Gartner/Hobbs 956 went out with a gearbox failure, while Peruvian Manuel Lopez, owner of Fitzpatrick's second entry, had lost control while leaving the pits and crashed heavily into the barrier on the outside of Copse Corner. Quite where Lopez earned his International licence is not clear, but he is obviously not up to the standard required in World class motor racing. While Ickx/Mass and Bell/Stuck reaped their due rewards in the final hour, the C2 class battle was going strong. The Ecosse was on its way to its first major success since the Ecurie's win at Le Mans in 1957, Spice and Bellm held back because their car wouldn't pick up the last 50-litres of fuel. The Carma-Albas had a very subdued run, Finotto's car overheating badly from the start and the second car having continual turbocharger troubles. The Mazdas weren't doing any better than expected, either, Kennedy's car having a fuel filter problem, then delayed by a collapsed rear wing, while the Yorino/Katayama entry broke its gearbox some eight laps before the finish. Even the final hour had its moments. Larrauri's 956 crashed heavily at Stowe when the rear bodywork flew off, littering the track with debris, and Patrese and Winkelhock locked in a desperate battle for third place in the closing stages. 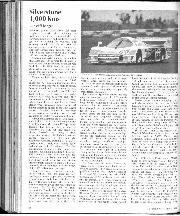 The Kremer Porsche had been delayed by a broken throttle return spring, and Patrese went by into third just a lap from the end, fending off Winkelhock's challenge by less than a second when the flag came out. 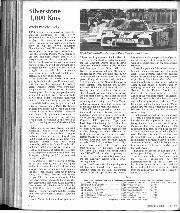 That earned Lancia-Martini 12 points in the Teams Championship, led by Rothmans-Porsche on 40 points, then KremerPorsche on 25 and Lancia-Martini 00 22. In the Drivers' Championship Mass and Ickx have 50 points, Winkelhock and Surer 45, Bell and Stuck 30, the next round being at Le Mans on June 15th/16th.